Seville (Spain) – April 10, 2019 (travelindex.com) – H.E. 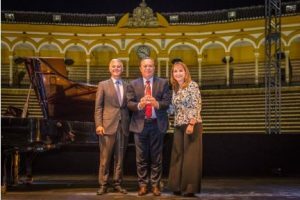 Gustavo Santos, Minister of Tourism, Government of Argentina, has been awarded a World Travel & Tourism Council (WTTC) Global Champion Award at the 2019 Global Summit in Seville, Spain, for his global leadership in the field of travel facilitation. The annual WTTC Global Champion Awards recognise outstanding public officials or countries who, through their leadership, have made a difference through pioneering public policies and initiatives that have increased the competitiveness of the sector within their respective countries. The WTTC Global Champion Award for Visa Facilitation recognises the country which has taken the greatest strides to facilitate travel for international visitors. Argentina now accepts visitors from 75 countries which have a visa to enter the Schengen area or the United States of America and can enter the country without an Argentine visa. This has been part of wide-ranging package of reforms implemented by the Government, under President Macri, to promote Travel & Tourism and help increase international travellers and drive investment. Gloria Guevara, President & CEO, WTTC commented, “For many years, our sector has worked tirelessly to make it easier for people to cross international borders as we have long recognised that Travel & Tourism drives economic growth, job creation and social development. Under the leadership of Minister Santos, Argentina has prioritised visa facilitation as the route to increase international visitors. “The work we have done generated the incorporation of 75 new nationalities that can now enter Argentina in an easier way. This is an additional measure, among others, to the air opening thanks to which 9 new airlines are flying today and another 20 increased their frequencies and destinations. So we seek to facilitate and encourage receptive tourism so that more and more travelers can reach our country,” said H.E. Gustavo Santos.